Looking to hire multiple products from us, saving you money and dealing with one company, then you have come to the right place. Here at AA Decorative Events, all the stock we advertise and promote is owned by us and we do not use third party companies. We keep our prices competitive by having low overhead costs. 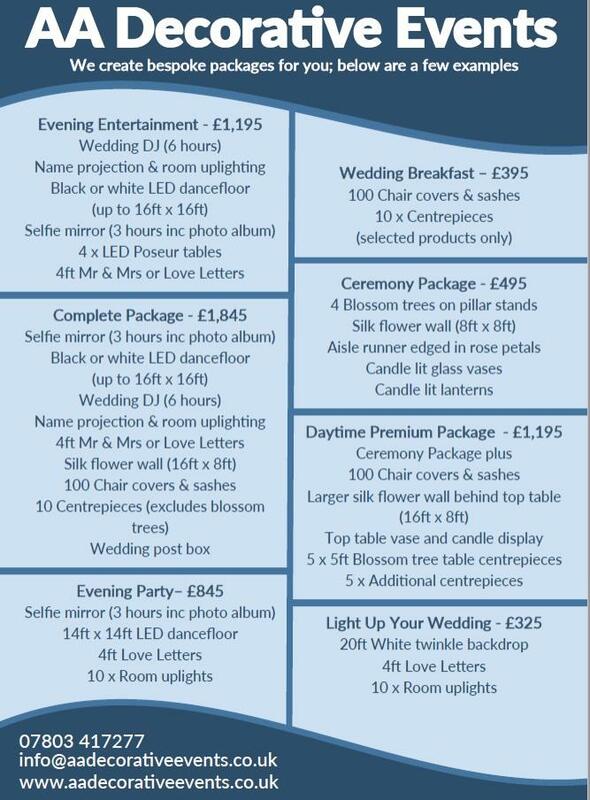 The below flyer is a sample of packages we can offer you for your wedding. Looking for a different package, let us know the products you are looking to hire and we will put together a package that fits what you want and apply a discount to the overall price. We hire all items individual, depending on venue and travel a surcharge may be applicable for delivery. This will be discussed and written within your quote. For Corporate Work, please call Alex on 07803 417277 or fill out the below enquiry form and we will arrange a call back or a consultation meeting to understand your requirements. We carry a £10m Public Liability Insurance and all electrical equipment is P.A.T. Tested for safety. Certificates available upon request.